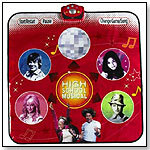 Using the High School Musical Dance Mat, kids can dance along to “Bop to the Top,” “Get’cha Head in the Game,” “Breaking Free” and “We’re All in This Together” from the hit movie “High School Musical.” Different areas of the mat will light up to indicate to kids where to move. All routines are pre-programmed and vary from beginner level to star level to superstar level. Launch date: July 15, 2007.